The TS in water electrode (WE) and water electrospray (WS) systems were also tested for the treatment of DNA and selected protein, biomolecules normally present inside the cells (Hensel et al., 2015). Figure 1 shows the effect of the TS operated in WE system on the solution of DNA. 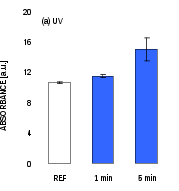 The analysis by UV spectrometry (Fig. 1a) showed the increase of the absorbance of the solution that corresponds to the fragmentation of total DNA molecules, where smaller fragments are responsible for higher absorbance. 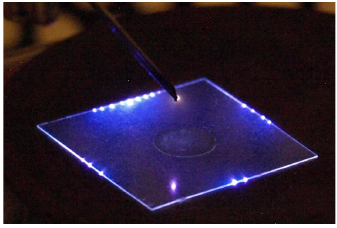 The effect of plasma exposure on DNA increased with the applied voltage amplitude and exposure time. Fig. 1. Analysis of DNA after plasma exposure in the WE TS system analyzed by UV absorption spectroscopy (a) and 1140 bp amplicon fluorescence (b) [9 ng/μL of DNA in 2 mL of DI water, solution flow rate 5 mL/min]. Bovine Serum Albumin (BSA) was used as a model protein to be exposed to the TS. 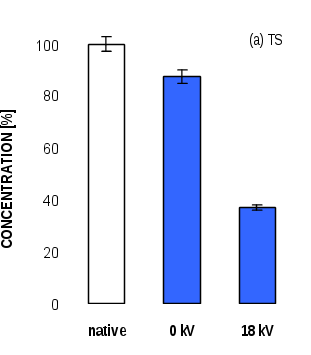 Figure 2 shows that the concentration of BSA in the TS WS system decreased with the applied voltage. The results show that the concentration of BSA decreased by 47% after 6 min exposure with 18 kV. In summary, the plasma treatment results in decomposing the biomolecules: fragmentation of DNA and denaturation of protein. Fig. 2. 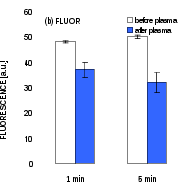 Concentration of BSA in water solutions after plasma exposure to the TS WS system (a) [1 mg/mL of BSA in 3 mL of DI, solution flow rate 0.5 mL/min, exposure time 6 min].